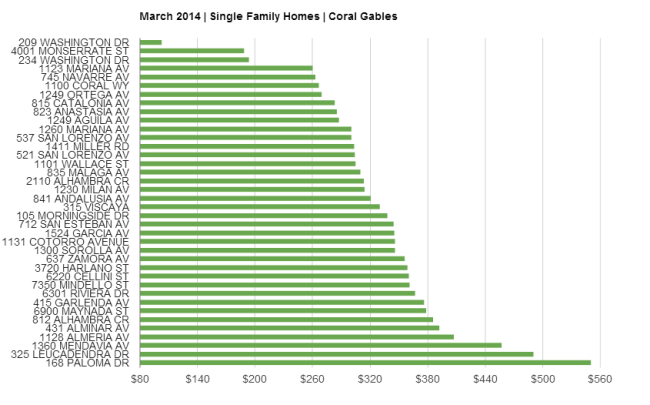 The month of March showed a noticeable increase in the amount of sales in Coral Gables. There were 39 single family home sales this month, compared to last months total of 24 sales. Of the 39 sales, only four of which were waterfront and golf view properties. The average price per square foot for non-waterfront homes was $314, which is the coincidentally the exact same as last month. The average sales per square foot for waterfront homes dropped down to $499 from $598 last month. However, on both the graph and in this average, I omitted one sale last month. The home at 145 Leucadendra Drive sold for $7,000,000 in the month of March. The home on this property is 3,221 sq.ft. and calculating the price per sq.ft. would have skewed our average greatly, as it is very high at $2,173 per sq.ft. This property has such great value because of the size of the lot (36,098 sq. ft.) and because it is waterfront. Stay tuned to the blog to see how the trends in Coral Gables change over the month of April!